Enjoy movies, music, travel guides and more — all for FREE! Get exclusive deals and discounts on merchandise and activities. Stay online and in touch with your loved ones throughout your flight. Need Internet? Buy before you fly and get a discount! 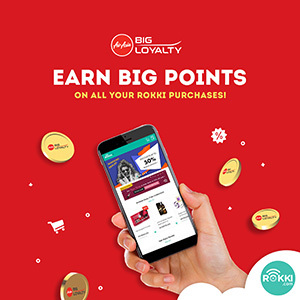 Get more bang for your buck – now you can earn AirAsia BIG Points on all your purchases made on ROKKI! From Internet Plans to Shop merchandise, get rewarded in a BIG way when you spend on ROKKI! All you have to do is link your BIG Loyalty account when you connect to the ROKKI Portal during flight. Find out more here. ROKKI is AirAsia’s on-board Wi-Fi that offers in-flight entertainment and connectivity at your fingertips. Using your personal mobile device, you can enjoy FREE access to www.rokki.com, where you can watch movies, read travel guides, view shopping catalogues, more! You can also get Internet access to surf the web and use your favourite apps by purchasing a ROKKI Plan. What do I need to use the Wi-Fi service? You will need your mobile phone or tablet with Wi-Fi capabilities to use the service (laptops are currently not supported). To get connected, simply turn on Flight Mode on your mobile device and connect to ROKKI Wi-Fi. Once connected, you will be automatically redirected to visit the ROKKI Portal at www.rokki.com to enjoy free in-flight entertainment or to purchase a ROKKI Plan to get Internet access. When can I start using ROKKI during my flight? You can start using ROKKI once the in-flight Wi-Fi announcement has been made or when the seatbelt sign has been switched off. Please note that the service will automatically turn off when the aircraft reaches below 10,000 feet. When flying within the territories of India, only in-flight entertainment will be available, while the Internet service will be switched off due to country regulations. Is this service safe and approved for use on board the aircraft? Yes, this service has obtained all aviation standard approvals from the Department of Civil Aviation (DCA), Malaysia and Federal Aviation Administration (FAA), USA. It has also obtained telecommunication licensing from the Malaysian Communications and Multimedia Commission (MCMC), the telecommunication regulatory body of Malaysia. Send us your enquiries, feedback, and comments by getting in touch at www.rokki.com. Crazy, bright ideas are always welcome, too.